Until a few years ago, the leading authority on what it means to own a copy of a computer program was the 2nd Circuit’s 2005 opinion in Krause v. Titleserv, Inc., 402 F.3d 119. There, the court held that a person owns a copy of software if he “exercises sufficient incidents of ownership over a copy of the program to be sensibly considered the owner of the copy . . . .” As the Copyright Office noted in its 2012 recommendation to the Librarian of Congress, the 2006 and 2010 rules exempting cell phone unlocking from the DMCA reflected an understanding, based in part on the holding in Krause, that a typical cell phone owner exercises a level of dominion over her device (and its digital contents) more akin to traditional property ownership than the licensed use of property owned by another. But in 2010, the 9th Circuit took a very different approach in Vernor v. Autodesk, Inc., 621 F.3d 1102, in which the court held that a “software user is a licensee rather than an owner of a copy where the copyright owner (1) specifies that the user is granted a license; (2) significantly restricts the user’s ability to transfer the software; and (3) imposes notable use restrictions.” Because a typical cell phone owner is bound by a “click-wrap” agreement that significantly restricts her ownership rights in her phone’s operating system, she’s arguably a licensee of the software—not an owner of a copy—according to Vernor. How would the bills recently introduced in Congress address the cell phone unlocking issue? Let’s take a look at each bill. To begin with the simplest of the cell phone unlocking bills, Sens. Leahy, Grassley, Franken, and Hatch’s Unlocking Consumer Choice and Wireless Competition Act (S.517) would simply amend the Code of Federal Regulations, replacing the pertinent paragraph from the Librarian of Congress’s 2012 rulemaking (codified at 37 C.F.R. § 201.40(b)(3)) with its more permissive 2010 analogue. The bill also tasks the Librarian of Congress with determining whether to extend the unlocking exemption to other wireless devices (e.g., mobile broadband-enabled tablets), based on the DMCA’s usual rulemaking criteria. By restoring the broad DMCA exemption for phone unlocking in force from 2006 to 2012, S.517 addresses the problem at hand without going too far. It neither forces carriers to help users unlock their phones, nor limits carriers’ ability to recover damages from subscribers who breach their contracts. Rather, the bill would simply shield users who unlock their cell phones from the DMCA’s harsh penalties. In striking this balance, S.517 deserves credit for aiming to solve a discrete problem with a narrowly-tailored solution. But would S.517’s fix last? Given that “[n]othing in [the] Act alters . . . the authority of the Librarian of Congress under [the DMCA],” S.517 would presumably leave unchanged the substantial deference enjoyed by the Librarian regarding his decisions about which circumvention tools to exempt—including cell phone unlocking tools. If, three years from now, the Librarian boldly decides that his 2012 decision to curtail the phone unlocking exemption was correct, and thus restores the language currently in force, Congress will be back at square one. For a more lasting solution, Congress could act under the Congressional Review Act (“CRA”) to pass a resolution expressing its disapproval of the Librarian’s 2012 rule. If both houses of Congress were to pass such a resolution, and the President were to sign it, the narrow cell phone unlocking rule would be nullified—permanently. And the Librarian couldn’t simply reissue the rule, as a rule nullified under the CRA “may not be reissued in substantially the same form.” 5 U.S.C. § 801(b)(2). Admittedly, this would be a novel use of the CRA. Congress has historically used the law’s disapproval procedure to review rules promulgated by “ordinary” federal agencies (i.e., agencies that are entirely within the Executive Branch). Nevertheless, the Library of Congress is arguably an “agency” for purposes of the CRA insofar as it promulgates rules of general applicability. As the D.C. Circuit recently held in Intercollegiate Broad. Sys., Inc. v. Copyright Royalty Bd., when the Library of Congress exercises its “powers . . . to promulgate copyright regulations . . . the Library is undoubtedly a ‘component of the Executive Branch. '” 684 F.3d 1332, 1341-42 (D.C. Cir. 2012) (citing Free Enterprise Fund v. Public Company Accounting Oversight Bd., 130 S.Ct. 3138, 3163 (2010)). Sen. Ron Wyden’s Wireless Device Independence Act (S.467) is the only cell phone unlocking bill that actually amends the DMCA. It would add to section 1201 a clause specifying that modifying software on a mobile device so that it operates on a different network is exempt from the law. While his colleagues dance around the underlying problem—the DMCA itself—Sen. Wyden tackles it head-on. To his credit, this approach embodies Congress exercising its proper constitutional role. If the legislative branch is dissatisfied with how an agency has exercised its statutorily delegated authority, the legislature ought to respond by amending the agency’s enabling statute. However, S.467 contains a potentially massive loophole: it only exempts from DMCA liability “user[s] [who] legally own a copy of the computer program” installed on their mobile phone. In other words, the bill would do nothing for users who are mere licensees of the software installed on their phone. This may not matter for residents of the three states under the jurisdiction of the Second Circuit, where Krause controls—but for cell phone owners in the Ninth Circuit, where Vernor controls, S.467 is unlikely to offer much relief. Because most mobile operating systems are accompanied by click-wrap contracts that impose significant use and transfer restrictions on users, under Vernor these users are considered licensees, rather than owners of a copy of the operating system. If the Wireless Device Independence Act were enacted, therefore, most Americans wishing to unlock their cell phones would still face significant legal uncertainty regarding their potential liability under the DMCA. To remedy this, the bill could extend its safe harbor to encompass cell phone unlocking by licensees, as well as owners, of software. Pursuant to its authorities under title III of the Communications Act of 1934 . . . the [FCC], not later than 180 days after the date of enactment of this Act, shall direct providers of commercial mobile services and commercial mobile data services to permit the subscribers of such services, or the agent of such subscribers, to unlock any type of wireless device used to access such services. Nothing in this Act alters, or shall be construed to alter, the terms of any valid contract between a provider and a subscriber. Note the absence of any explicit amendments to the DMCA or related regulations, or any mention of circumvention tools. Instead, the bill empowers the FCC to regulate carriers’ unlocking policies, yet leaves the DMCA intact. This drafting decision has led some commentators to pan the legislation, questioning its effectiveness and scope. While I too have serious concerns about S.481, I think Sina Khanifar (who started the White House petition about cell phone unlocking) may be incorrect to suggest the bill “doesn’t do anything at all.” It seems to me that S.481 would alter the DMCA’s unwritten contours, albeit in narrow ways. How can a law that doesn’t even mention the DMCA effectively “rewrite” its anti-circumvention provisions? 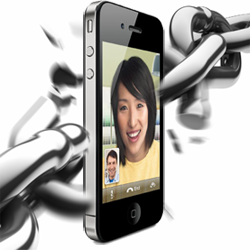 Consider that S.481 and the DMCA’s section 1201 both purport to deal with the subject of cell phone unlocking. To borrow a term from legal Latin, the two laws are in pari materia (“upon the same subject”). While section 1201 focuses on the general issue of circumvention of copyright access controls without mentioning cell phone unlocking, S.481 specifically and exclusively addresses cell phone unlocking. Where one statute deals with a subject in general terms and another deals with a part of the same subject in a more detailed way, the two should be harmonized if possible. But if two statutes conflict, the general statute must yield to the specific statute involving the same subject . . . .
2B Sutherland Statutory Construction § 51:5 (7th ed.) (internal citations omitted). But courts could just as well construe S.481 to effect none of these changes. There is no such thing as stare decisis when it comes to statutory construction. If Congress wanted to alter the DMCA, courts might reason, Congress would have done just that. S.481 simply requires that carriers help off-contract subscribers unlock their phones, so why read into the statute a meaning that conflicts with other laws? Perhaps there are persuasive reasons for trying to tweak the DMCA without actually amending the law, but I’m not aware of any. Given how widely courts vary in interpreting vague statutes, it’s awfully risky to gamble on judges who review S.481 correctly divining Congress’s intent if it enacts the law. Given the FCC’s historically limited understanding of how markets work, unleashing it on the wireless industry is especially unwise. This isn’t a market in need of regulation; in fact, consumers enjoy plenty of choices among devices, carriers, and payment plans. If you want to buy the latest smartphone sans carrier lock, chances are you can order it today and have it on your doorstep tomorrow. If anything, Congress should be exploring ways to shrink the FCC’s role in the mobile communications space, among others. Like co-liberator Jerry Brito, I think the ideal public policy approach to cell phone unlocking is fairly straightforward. If I own a cell phone, I should be free to modify its software (or hardware) so that it works on any carrier’s network—unless I’ve agreed in contract not to unlock my phone. If I go ahead and unlock my phone anyway, I owe my carrier compensation for its damages resulting from my breach—which are typically specified in advance in the form of an early termination fee. If the contract doesn’t specify an early termination fee, I owe my carrier damages equal to the amount necessary to put the carrier in the same position it would have ended up had I held up my end of the bargain. This is the common law in action, simple yet elegant. [T]he access controls do not appear to actually be deployed in order to protect the interests of the copyright owner or the value or integrity of the copyrighted work; rather, they are used by wireless carriers to limit the ability of subscribers to switch to other carriers, a business decision that has nothing whatsoever to do with the interests protected by copyright. This is not to say that carriers are wrong to limit some subscribers’ ability to switch networks. To the contrary, American consumers enjoy substantial benefits thanks to the availability of carrier-subsidized, locked cell phones, as George Ford, Thomas Koutsky, and Larry Spiwak argue in A Policy and Economic Exploration of Wireless Carterfone Regulation, 25 Santa Clara Computer & High Tech. L.J. 647 (2009). The question is thus not whether consumers should be permitted to unlock their cell phones, but what legal regime(s) should deter wrongful unlocking. As Jerry rightly argues, contract law affords mobile carriers a far more appropriate set of remedies for wrongful unlocking than the Copyright Act does. Cell phone unlocking may be a fairly clear-cut issue, but the broader debate over whether, and to what extent, federal laws should ban tools that circumvent technological measures protecting copyrighted works is anything but straightforward. Critics of the DMCA’s anti-circumvention provisions offer powerful arguments why Congress shouldn’t be in the business of banning technologies, but there remains a fine line between selling lock picking tools and helping people unlawfully pick locks. In a forthcoming essay, I’ll explore the anti-circumvention debate in greater detail. For a scholarly treatment of the interplay between the DMCA and cell phone unlocking, check out Daniel J. Corbett’s article, Would You Like That iPhone Locked or Unlocked? : Reconciling Apple’s Anticircumvention Measures with the DMCA, 8 U. Pitt. J. Tech. L. Pol’y 8 (2008).